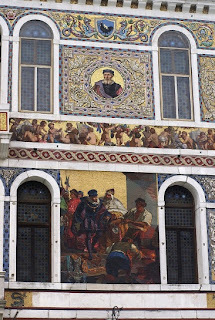 Located near the entrance to the magnificent Grand Canal on the left side about halfway between the entrance to the canal at the Doge's Palace and the Ponte dell' Accademia, this 16th century building was used for the design, light manufacture (cutting and assembly of the smalti), sale and display of Salviati mosaics. 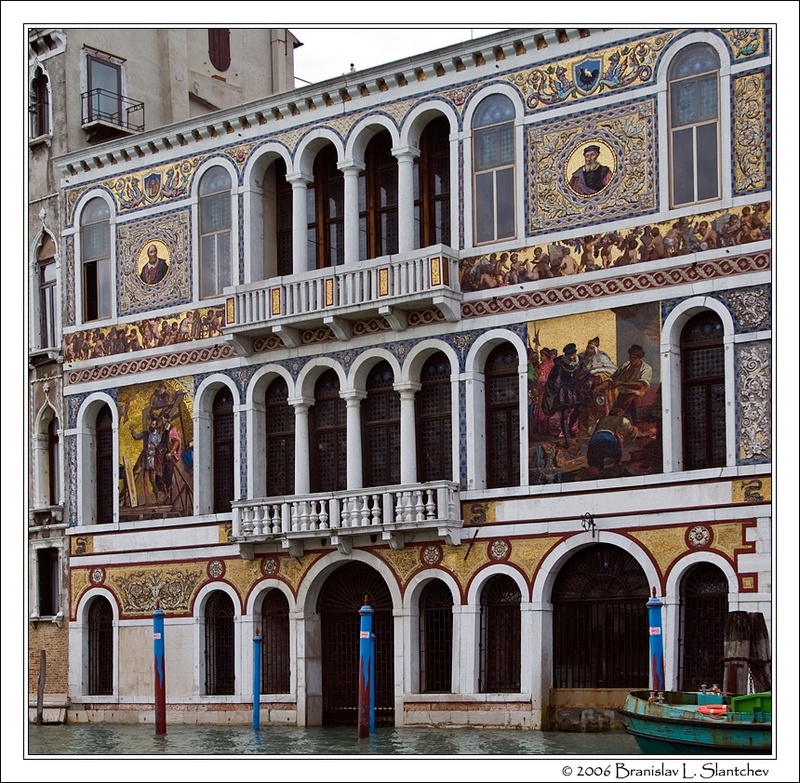 This is not the same building as the Palazzo Barbarigo Hotel, which is further down the canal, but rather the one just a few hundred feet from the location of the Peggy Guggenheim Collection. Coincidentally, another two hundred feet past the Guggenheim building is the Palazzo Salviati, a 1924 building that was also lavishly decorated with mosaics to advertise the company's products. 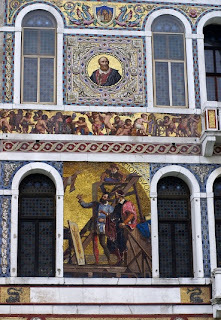 The mosaic scenes on the Barbarigo's maritime facade were added in 1868. The central frieze shows thirty-five cherubs pursuing various artistic endeavors including painting, drawing, sculpture and architecture. 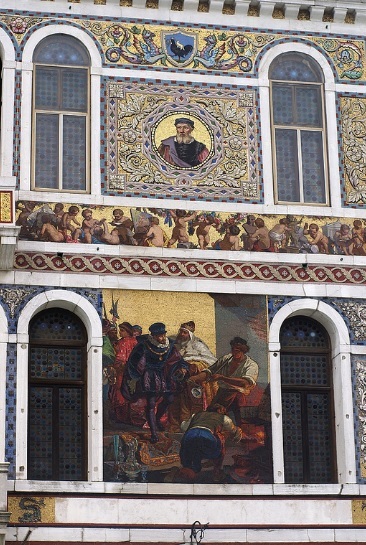 The two individual murals - designed by Giulio Carlini - commemorate 16th century royal visits to Venice including Charlemagne (Charles V, Holy Roman Emperor) speaking to Titian on the scaffolding of St. Mark's Basilica. 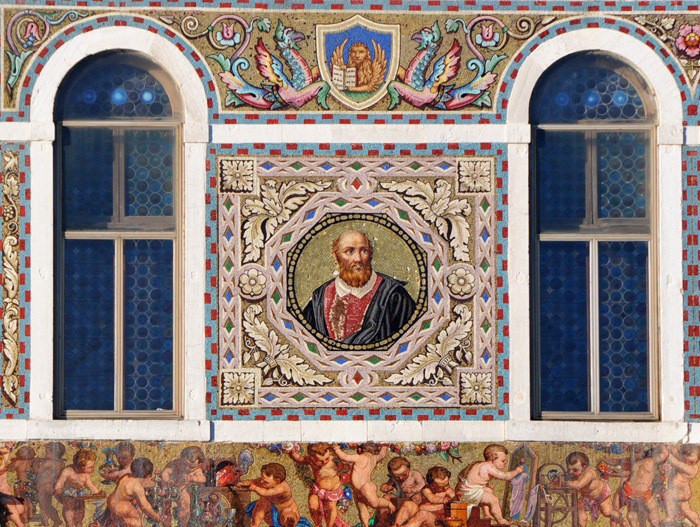 A young mosaicist looks on from above, pausing from his work. The second mural shows the future French King Henry III in 1574 on the Doge's barge along with a team of glassmakers. 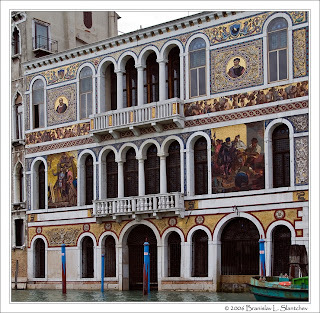 Portraits of arguably the two most famous Venetian painters - Titian and Tintoretto - are located above each scene. St. Mark's lion - the symbol of the city of Venice - tops one of the two individual portraits, while the back rooster - the symbol of Murano - crowns the other. Barr, Sheldon. 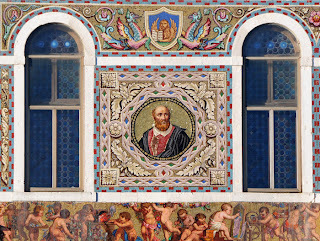 Venetian Glass Mosaics: 1860-1917. London: Antique Collectors' Club, 2008. 27, 31-32. Smith, George Ed. The Cornhill Magazine. XIX. London: Smith, Elder and Co., January to June, 1869. 462.